With the massacre looming over Idlib we are lead to believe by the World Leaders and the media that those in Idlib are all terrorists. While the world has this view the lives of one million innocent Syrian children are at stake and everyone remains silent. I recently saw Vanessa Beeley and Eva Bartlett attacking a 6-year-old child named Hala on Twitter from Idlib and it made me realise these children have no way to fight back. This is their chance to do so. This is their chance to show the world that they too are human beings. They are children with hopes and dreams just like our own children and grandchildren. If we put a human face to these children of Syria then perhaps you all may think twice about condemning them. These children have emotions and feel pain. They laugh and they cry and they feel abandoned by the World. Please listen to Om Amran and the reasons why they suffer. Om Amran has had the pleasure and joy and sadness of working with the Syrian children throughout the opposition-held region. She has listened to their fears, their hopes and their goals for the future. She will give us an inside look into the hearts and minds of this future generation of Syria. She will show us the human face behind the eyes of the Syrian children. What does the future hold for the children of Syria? 1. How long did you work with the Syrian Children? control of the regime. My work was as a psychological guide for the children. 2. What was the capacity of your job with the children? at the same time because I discovered a strange and beautiful childhood world. Children have an extraordinary ability to deal with things and they have a very beautiful imagination, but unfortunately, the war was controlling their lives. 3. Before the revolution what did the children speak of? What were their goals for the future? What were their fears then, if any? you could find a large proportion of children who had either dropped out of school or were working before they reached puberty. I want to say that totalitarian rules makes for generations that are incapable of thinking and creativity because they are not allowed to do so. They want to make a generation of slaves. It is true that there was no war in Syria before the revolution but there was no creative generation either because of the economic conditions and because of the totalitarian rule which depended on favouritism and the killing of freedom. 4. After the revolution how did the children change? Were they excited about the revolution or scared to speak up? sent back to his mother with the effects of torture clearly all over his body! The regime at the beginning of the revolution was storming the homes of civilians and taking the children for interrogation. They used to interrogate the children to see if any of their family or one of their relatives were against the regime. In addition, the regime arrested the children and tortured them. The regime was a formidable terror for everyone. Therefore, the people opposed to the ruling regime were teaching their children to be very careful and not to say anything against the regime. 5. When children were being detained by the regime and tortured and killed what was the mood of the Syrian children at this point? Did the children fear the repercussions from the regime? school and carry a gun to kill the person who killed his older brother". A second child told me "I would form an armed battalion and storm the prison to get my father out". The kids had violent ideas, unfortunately. children of this age group took up arms and left their education and school. Many of them became intellectually radical. In my opinion, this age group is the one that should be highlighted because it is dispersed and the war has affected them all psychologically, intellectually and socially so they will produce a more backward society. 6. When war broke out did you see the children change? Was there changes in their behaviour and mood? Syria has lived a relatively long war and this war has had close effects that can be seen immediately and other effects that will emerge after a period of time. Close or Observable Effects - I noticed that the children became more aggressive in their thinking and behaviour too. For example, when I was asking children to paint they were painting dead people, planes and rockets. When they were playing with each other they were playing a game that revolved around a war between the regime and the opposition. There were children suffering from psychological and physical illnesses due to the war such as isolation, urinary incontinence and difficulties with speech like pronunciation and stuttering. In addition the children of Syria during the war dropped their level of education because of the destruction of schools and the displacement of the people and poverty. Long Term Effects - Here there is a question that should be asked. "If the war ends, can generations born in the late 1990's and early 2000's be able to build a state? In fact I think this will be very difficult. The reason is that this generation lived with injustice and lived with the extremist groups. A large section of them left the country to go abroad and some of them have remained in the areas of the regime. In other words there will be a cultural, social and intellectual rift among members of this generation. 7. What were the main fears of the children when it came to war and the airstrikes? This question was one of the questions I asked the children. I will mention some of their answers. Some may sometimes appear funny but they are also an indication of the deep tragedy they have endured. One child replied " I'm not afraid of the plane and if the plane kills me, I will be happy because I will find my father in heaven" Another child answered " I hate the plane and the bombing so much because it demolished my sister's house. My sister came to live in our house with her two babies. Her babies are now crying all night" Another child's answer was very sad and he started to cry when I asked him this question. He said that " he did not like bombing planes because he was afraid it would cut off his hand as it did to his cousin". In fact, most children were afraid of the sound of warplanes very much and they used to run to the teachers to hide from the planes. 8. Were the children worried about being displaced or dying? Did you lose any of the children you knew in this conflict? tree too" I felt very sad then. Even though children play and have fun, they know they may die at any moment. 9. 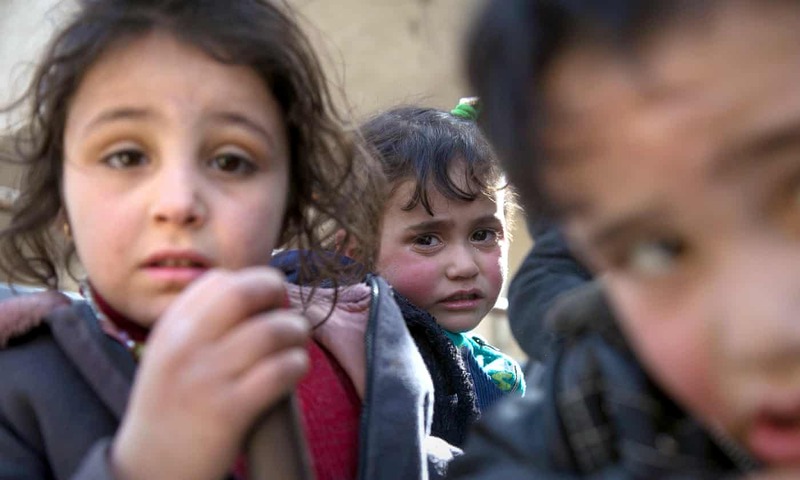 Did the children of Syria succumb to fear or were they able to remain hopeful for the future? to imagine this is the plane in the sky, but a little girl tells me "You are lying teacher. The planes we see in the sky are dropping bombs to kill us"! Making children optimistic about a better life is very difficult but it is not impossible. Children need a safe environment, peace and the cessation of war. They need care, love, education, home, and stability so that they will be optimistic about the future. 10. What do you think the next generation of Syrian children will be like? Do you think they will have hope for the future ? I told you that talking about the children's future in Syria can only take place when the war stops and the country settles economically, socially and politically. Syria is still suffering from the effects of war and destruction. No Syrian child can feel hopeful or optimistic before there is an environment of security and stability in Syria. In Syria there are thousands of children without parents, thousands of children have lost their limbs and most of them are without education. On top of this is the displaced families and homeless children. In addition, Syrian children suffer from psychological disorders and their ideas are dispersed. Syria's children will need support to play a role in rebuilding Syria. Commenting on this Story will be automatically closed on December 5, 2018. From the article: "910 children were killed in Syria in 2017, 50% more than the previous year, and the highest recorded since the conflict began in 2011"